Summary: Pasta n' More is made of certified materials, fits in any microwave, its dishwasher safe and makes dinner for 1 or a family of 9. Pasta n' More is made of certified materials, fits in any microwave, its dishwasher safe and makes dinner for 1 or a family of 9. The unique design swirls the water and not the pasta, quickly cooking it to a perfect al dente texture! Without stirring, breaking or sticking! It has measuring handles, so you'll always prepare the perfect amount every time. 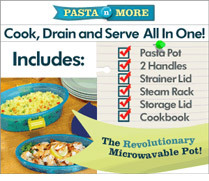 Pasta n' More also includes a steam rack to make baked potatoes, healthy vegetables or flaky fish. You'll receive the air-tight storage lid to keep left-over's fresh and perfect for saving, storing or reheating meals in an instant. You can make mouth watering shrimp, tasty corn, fluffy rice, chocolate cherry cake and much more! It makes mealtime more fun for the entire family!